In her book Theology in Aisle Seven, Carolyn Arends tells of the time in a pre-concert prayer meeting when she prayed something like, "'God, we invite you here among us.'" The next person to pray—the church's minister—contradicted her theology when he prayed, "'We know we do not have to request your presence because there is nowhere you are not. So we celebrate the fact you are already here with us now'" - Theology in Aisle Seven, Kindle Location 141. In a way Paul's prayer for the Ephesians when he requests that God make them able to comprehend Christ's love for them, is his subtler request for his readers of what Carolyn desired. We all want to feel God is with us, to sense His presence, to know He wraps us in a loving hug. Paul gives us the key to how that begins when he says "...that Christ may dwell in your hearts through faith..."
But what about those times God feels distant, or even absent? "...for the biblical writers, heaven is close. In fact the 'first heavens' is a term used to describe the earth's atmosphere. So when Jesus describes the invisible (but very real) realm that God inhabits, he lets us know it's not only out there, but also as near as the atmosphere surrounding our bodies and the air we breathe" - Arends, Theology, KL 161. 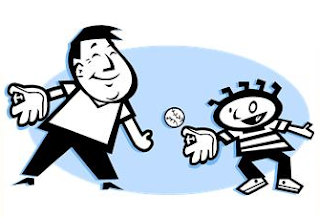 She found another piece of the puzzle when a colleague shared an article about a father and son playing catch and related such an activity with fathering and being a child. "They do not call it a game of throw," her friend said, "but catch." "God is the initiator. We love because he first loved us. We're here because he thought of us and welcomed us into his world. Yes, he stands at the doors to our hearts and knocks, but we need only let him in" - Arends, Theology, K.L. 174. Doesn't all that help us comprehend His love and presence a little better? PRAYER: Dear God, thank You for being here, all around me, as present as the air I breathe. Help me to catch the signals of Your nearness in the blessings that flow through my day, the prickly lessons, and the sadnesses that keep my heart soft. May I affirm Your presence by throwing my thankfulness back to you. Amen. MORE: But don't we need to catch God's attention? More Arends: "I suspect I have sometimes unconsciously used spiritual disciplines as smoke signals to get God's attention. Now I am learning that they are simply ways of letting him capture mine" - Carolyn Arends, Theology, K.L. 16.